Snake print satin midi length slip dress with cowl neckline. Hidden side zipper and side slit. Model is 5’7” and wearing a size small. 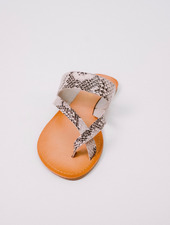 Snake print sandal with toe wrap detail. Man-made materials. Pleated pastel snake print maxi skirt. Model is 5’9” and wearing a size small. High waisted, spandex blend snake print biker shorts. Coordinating top is sold separately. Model is wearing a size small.